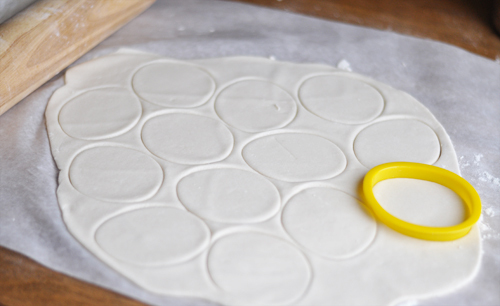 Salt dough lends itself to all sorts of shape making. Once baked to thoroughly dry, the dough is hard and can last for years. The dough is also paintable which makes it all the more fun. 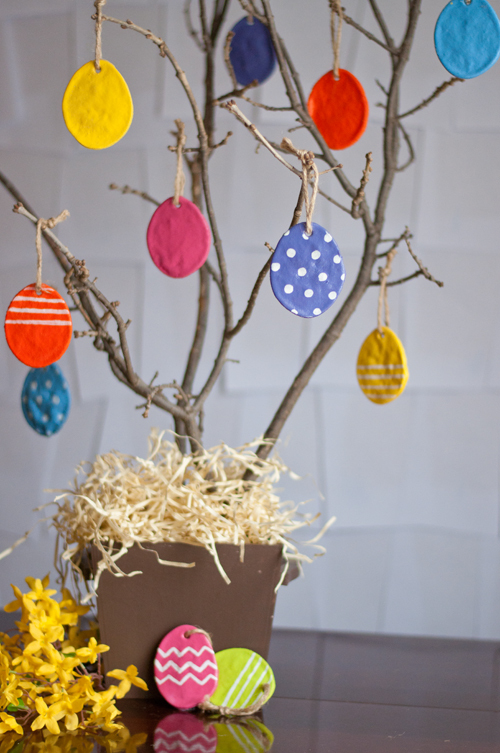 I love the tradition of an Easter Tree — a branch on which to hang eggs, bunnies and colorful bits. Part of this batch of Salt Dough Easter Eggs will hang on our tree but I hope to hang some outside too. You see, if a spray paint or clear spray paint sealer is used, these ornaments can hung outside and inside alike. I think seeing bright bits of color amidst the early spring landscape would be lovely, don’t you? Let’s get started. Roll it out (I rolled mine to 1/4 inch thick) and cut out desired shapes. 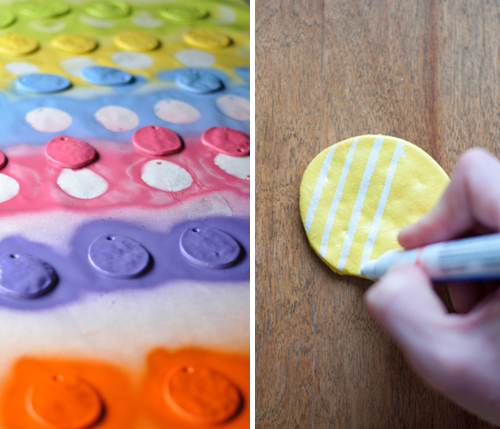 Place the salt dough Easter eggs on the parchment-covered baking sheets. Remember to make a hole so you can hang the ornaments — a straw works perfectly! Once the shapes are adequately baked, dried and then thoroughly cooled, it’s painting time. I like using spray paint because it’s faster and easier but acrylics work just as well. Allow the paint to thoroughly dry. 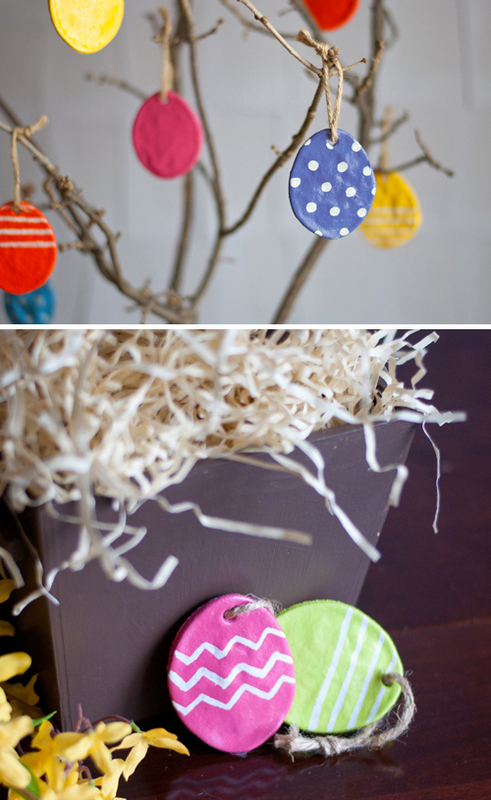 Use paint pens to add polka dots or lines of decorations to the eggs. Optional: To further protect the color and design, add a clear coat sealer. Loop twine or ribbon through the holes and hang. Hooray! 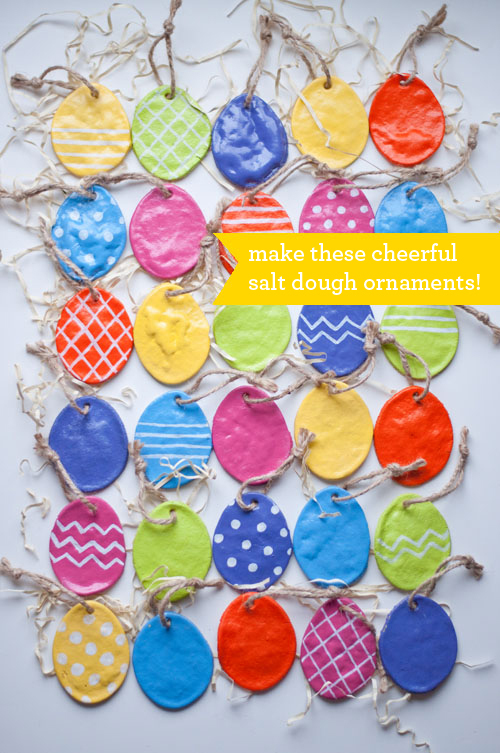 Your Salt Dough Easter Eggs are finished. It’s feeling more spring like already! P.S. — Adorable Painted Egg Cartons. And favorite craft supplies. Credits: Photos by Amy Christie for Design Mom. These are really cute. I remember making little branch trees like this as a kid. We’d cut out paper hearts and write our wishes for spring on them. Maybe it’s a tradition I need to carry on with my little girl too! These are so adorable! I pinned this and then came to your site to see how you painted your perfect polka dots and stripes. I love the idea of using paint pens! We’re going to make these today. I hope you had fun making them! Gabrielle – PLEASE update this post to add a warning for dog owners. Salt dough is very dangerous and DEADLY for dogs! Please keep salt dough way up high away from dogs, the salt smell will lure your dog and they like the salty taste but the high salt content can kill them. What a fun (and easy!) craft for the kiddos! We usually have about 15-20 children at our home on Easter and we’re always looking for fun new crafts to keep everyone busy in the afternoon. I think we’ll have to try this one this year. We shared this as a pin as well. Thanks for sharing! I love these! Can’t wait to make some with my son. Thanks! I too remember your “Easter tree”. Your Mom was so great about decorating for the seasons, and for the children. I am thinking about making these for some spring color, and grandchildren fun. Thanks Amy! It would be fun to do some all together! Do you use plain flour or self rising flour??? Does it matter?? I was wondering if anyone has done these with the kids coloring the eggs with markers? Are the eggs too breakable for young kids to decorate with markers? My grandaughters and I are making these this afternoon to decorate next weekend!!! Love the idea. Thanks for pinning it!!! Thanks for such a cute idea! My grandmother always had an Easter tree, and now I know just how to pass the tradition along to my son! Will be making these today! Somehow I missed this cute post a few weeks ago! 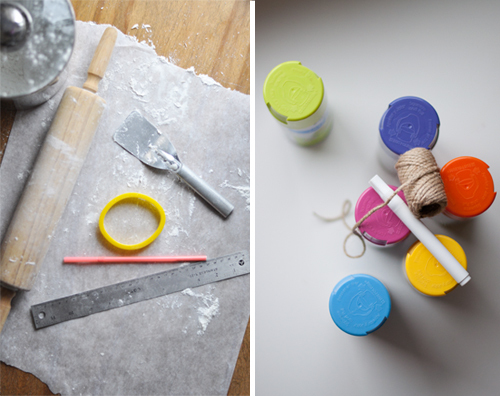 Thanks for the cute reminder of this fun craft–haven’t done it since Brownies in the 80s! Im making a greatgrandkids tree. 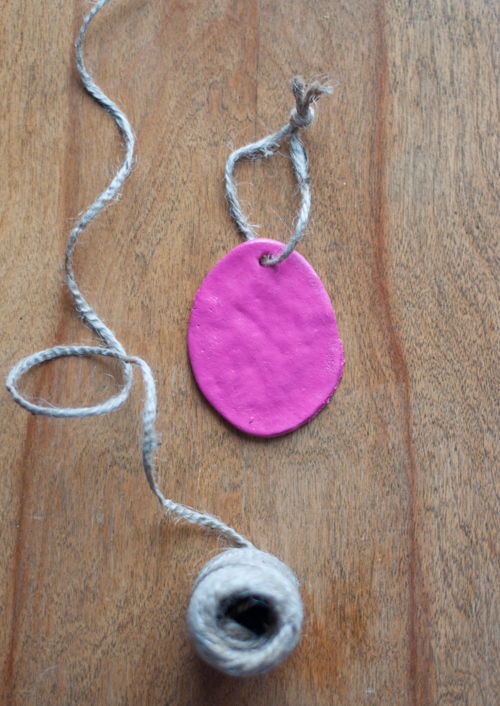 one egg for each child with name and picture on it, then hang on branch for display in frontroom. Would these be okay to use as decorations outside? Most definitely Lyn! Especially if you use spray paint! What kind of knot did you secure the twine with? I love these! We made them last year but set them on newspaper for spray painting. The paper stuck to the eggs. So lesson learned, we are going to try them again this year, here’s hoping they turn out better. DIY PÂQUES N°1 : LES OEUFS | Organisez moi ! 100 Easter Ideas - Decorating, Food and more! Love this idea. I’m thinking pumpkins and autumn leaves now that it’s fall. Good way to put those cookie cutters to use. Húsvéti dekorációs ötletek gyerekekkel | Játsszunk együtt! The recipe worked great in my case. For those who use C instead of F, baking the eggs at 120 C for 2 hours gave excellent results. 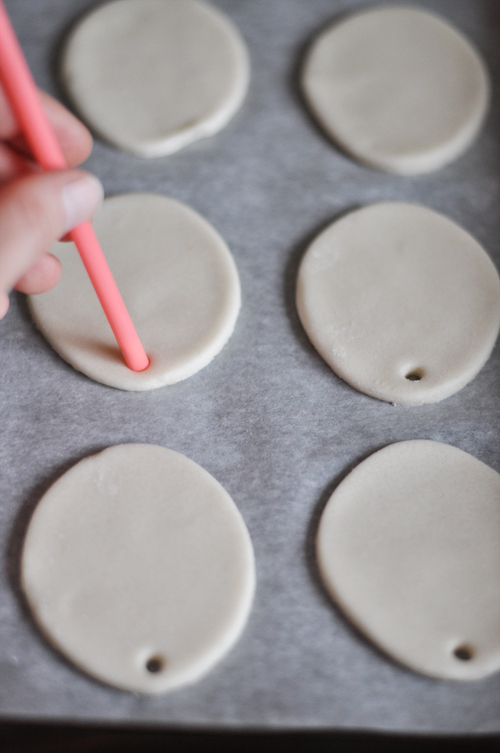 If you do not want to have air pockets building up, you may try to make the dough thinner: 1/4 inch thickness did not do the trick for me, so I made them thinner. Once painted and thoroughly dried, they came out pretty sturdy. Hi there! These are so cute. How many eggs did you get out of one batch? Wow, these look fabulous! Thanks. Mobdro Apk is a Amazing application to watch latest movies of Hollywood. What kind of flour? Plain or self rising or does it matter! Really Superb. Just Kill it. Wow, Awesome features to watch latest Hollywood Movies Online, All TV Shows with free of cost. I love making DIY stuff and this one seems to be great to make indeed and love what you do gal!